It’s perfectly possible to ﬁll your cheese board with artisan cheeses made in Scotland – in fact, you’ll be spoilt for choice. 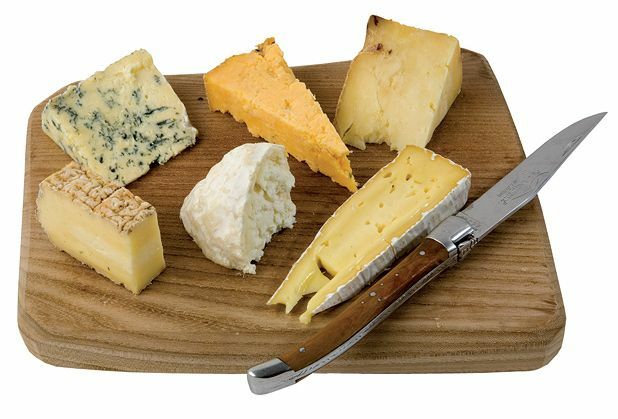 The Larder has teamed up with Pierre Leger of much-respected cheese retailer and wholesaler Clarks Speciality Foods to assemble a local cheese board featuring some of the country’s prime cuts. The sister of the crumbly pressed cheese made by Jane Andrews of the St Andrews Farmhouse Cheese Company near Anstruther in Fife, it’s made from unpasteurised cow’s milk and is naturally ﬂavoured with garlic and chives. The orange colour comes from annatto, a natural plant extract. As the only naturally ﬂavoured artisan or farmhouse cheese made in Scotland, Red Anster is out on its own. Simple Crowdie can be ﬂavoured with herbs or peppercorns, such as the Loch Arthur Creamery’s Crannog. If you like this style of cheese but not the ﬂavouring, original Anster has a fresh, lemony tang while the Connage Highland Dairy’s Cromal is an organic, light and crumbly cheese with clean ﬂavours made from pasteurised cow’s milk. Attractively shaped and named after the landmark island in the Firth of Clyde, this is an individual, fresh, fragile goat’s cheese with a bloomy rind and a light and ﬂuffy texture. Made by Ann Dorward in Dunlop, it’s one of the very few goat’s cheeses made in Scotland, and still only made in limited quantities. Putting a plain goat’s or ewe’s milk cheese on a cheese board opens up another broad avenue of tastes and textures. Ann Dorward makes a number of these, including Glazert and Bonnet, both goat’s milk cheeses. Based at Millaires Farm, Sorbie, by Newton Stewart, Galloway Farm Cheeses also makes the aromatic, nutty-ﬂavoured Cairnsmore cheese using organic, unpasteurised ewe’s milk, but only in the summer months. Made in Dumfriesshire by Barry Graham and the inspiring Loch Arthur Creamery, part of a Camphill community offering vocational opportunities to adults with learning disabilities, Criffel is an organic, unpasteurised cow’s milk cheese with a sweet, creamy paste and a contrasting washed rind. Semi-soft in texture, it carries some strong, pungent ﬂavours and is certainly a contender for the most impressive cheese currently being made in Scotland. Criffel does stand out for its distinctive style but it is worth looking out for Lanark White, made seasonally from ewe’s milk by Humphrey Errington in Lanarkshire, as well as his Maisie’s Kebbuck, a slightly ﬁrmer, unpressed cow’s milk cheese with a natural rind. A soft blue, mould-ripened cheese made using unpasteurised milk from Ayrshire cows by Humphrey Errington on his farm by Carnwath in Lanarkshire. When aged, the smooth, cream-coloured cheese is streaked with blue-green mould, and while it has a spicy ﬂavour, it’s mellower and creamier than its seasonal sister cheese, Lanark Blue, made from ewe’s milk. A number of other blue cheeses are made in Scotland. Highland Fine Cheese’s Strathdon Blue and Aberdeenshire's Devenick Dairy’s Badentoy Blue appeal to those looking for a milder, creamier blue, while Fatlips Castle Blue, made near Hawick by Jim and Annie Shanks' Standhill Cheesery, is produced in small rounds as a soft blue-veined cheese in the style of a blue camembert (cambozola). As the name hints, this creamy, cow’s milk brie is made near Tain by Ruaraidh Stone of Highland Fine Cheeses. It can be eaten as young as six weeks though it can mature for a number of months, with larger rounds tending to develop more ﬂavour than smaller versions. The milk is pasteurised, so it won’t ever reach the ripe tanginess of a cheese made from unpasteurised milk. Alternatives include the organic brie, Clava, made by Connage Highland Dairy, and the Devenick Dairy brie-style Monarch. In the Borders, the Standhill Cheesery has its Roxburgh Roondie. A recent addition to the Scottish cheese scene, this pressed cheese from the eponymous Cambus o’May creamery on Royal Deeside is made with unpasteurised milk. Using a technique called 'two-day curd', where the curds from two separate days’ milking are mixed together to achieve a distinctive marbled effect, the cheese is pale in colour but has some lovely nutty and earthy ﬂavours. Cheesemaker and farm café serving local produce and home baking with views towards the sea.